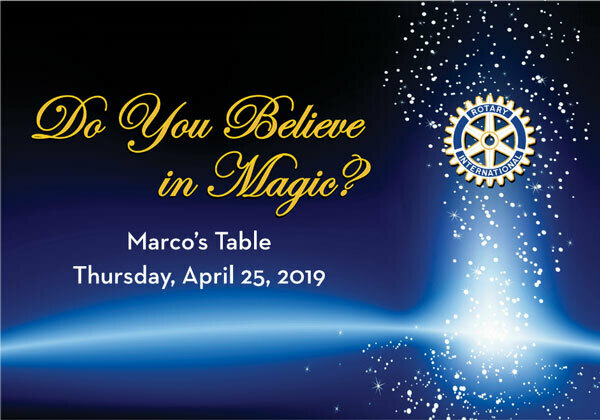 Founded in 1955, the Elmhurst Rotary Club is an organization of men and women who are committed to Doing Good in the World through community and humanitarian service and have the extraordinary capacity to change lives locally and globally. The club supports a diverse range of philanthropic programs and institutions, including District 205 schools, Elmhurst Memorial Hospital, the Elmhurst Library, Park District and YMCA and Elmhurst-Yorkfield Food Pantry as well as other local charities and organizations. We have also been major contributor to ShelterBox, a Rotary international disaster relief organization that provides shelter, warmth and dignity to victims of natural and man-made disasters. 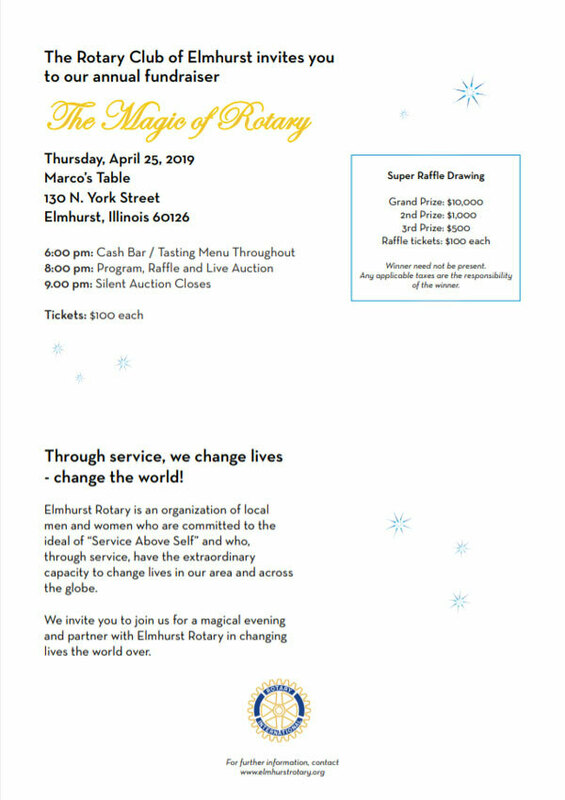 We raise funds for our charitable work with raffles, special events and donations from our members and the community. We welcome you to discover how you can make difference in your community and the world. Please contact vcahill@ymcachicago.org to schedule a visit or become a member. Once again, Rotary Club of Elmhurst hosted Thanksgiving Dinner at the Diplomat West. It was a great turnout Thursday, November 22, 2018, with 417 meals served at the tables and another 30 sent home with attendees for people who were not able to come. As always, Bob James dazzled the children with magic tricks and Mike Pavlick, with an outstanding group of musicians, entertained the guests while they ate. See more photos here. 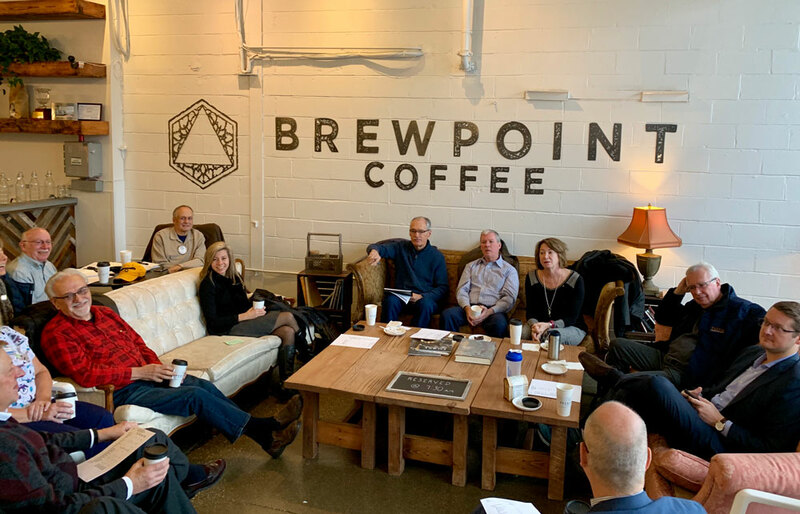 The club held our first monthly business meeting on November 15, 2018 at Brewpoint at 617 N. York Street at 7:30am. 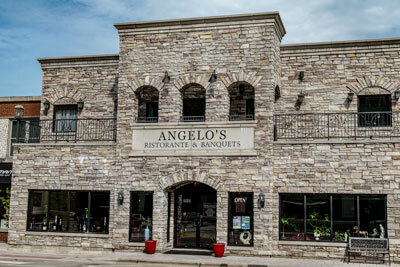 We will meet here every third Thursday in place of our noon meeting. All are welcome to check us out. We had a very special meeting on April 19, 2018 where the leadership team of the York High School Interact Club, along with faculty representative Leslie Stipe, were presented a $1,000 check from the Rotary Club of Elmhurst in support of their fundraising efforts for RevelationGolf, a charity that teaches the game of golf to war veterans and individuals with disabilities. Additionally this month, long-term members Ted Arey (left, in picture above right) and Tony Damiani were recognized for their outstanding service to the Rotary Club of Elmhurst at a recent club meeting at Lexington Square in Elmhurst, where both men are residents. Take a look at our special video below from the April 19 meeting to listen as student leaders speak about their charitable endeavors with Revelation Golf.